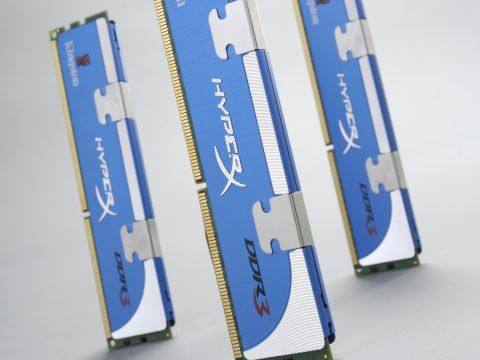 High-end triple-channel memory performance starts here. Worth the extra over cheaper kits. There's no getting round it. Intel's LGA 1366 PC platform is pricey. The cheapest compatible CPUs typically cost £200 or more. You'll also need to unload at least another £125 or so for a motherboard. And it would be rude not to snag a decent graphics card. Call that an extra £150. Once you've spent that much, it doesn't make sense turn cheapskate with your choice of triple-channel memory kit. With all that in mind, there's a strong argument for setting your sights no lower than the likes of Kingston's HyperX 1,600MHz. It's a little pricier than the equivalent triple-channel, 6GB Crucial Ballistix 1,600MHz kit. On paper, the Kingston HyperX 1,600MHz offers little to justify the price premium. After all, both kits clock in at 1,600MHz and offer identical 8-8-8-24 CAS latencies. But as we'll see, the HyperX has that little extra in hand that can make all the difference when clocking your CPU to the absolute max. As you'd expect, there's not much in it between the Kingston HyperX 1,600MHz and its closest competitor from Crucial at our default 1,333MHz test frequency. The HyperX kit does have a nanoscopic edge in terms of raw bandwidth and latency as well as nosing infinitesimally ahead in the x264 HD video encoding benchmark. But trust us on this: it's nothing you'd notice in the real world. Likewise, it's a similar story at 1,600MHz. Both kits deliver an identical 27GBps of raw bandwidth, 61ns response and 74 frames per second in World in Conflict. Remarkable stuff. There's even less than a frame per second between them in x264 HD video encoding, too. In other words, it's too close to call. Thus, overclocking is where the Kingston HyperX 1600MHz must drive home an advantage. By achieving 1,866MHz to the Ballistix's 1,600MHz, it finally gets its nose in front. For starters, that generates a surprisingly hefty advantage in the World in Conflict game benchmark – 78 frames per second plays 74. Arguably even more important are the extra options the increased clockspeed gives you when it comes to cranking up the clocks on that precious LGA 1366 processor. 266MHz isn't a huge advantage, but it might just make the difference between getting the maximum speed out of a given processor and being slightly disappointed. Whether that's worth the £14 premium depends on your attitude towards overclocking. For peace of mind alone, it's an investment we'd certainly be happy to make.